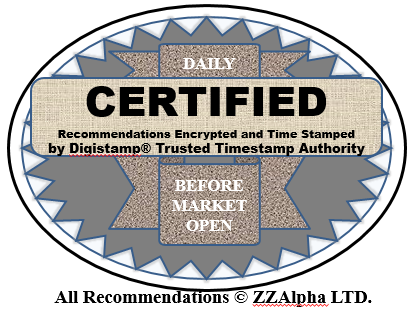 Every ZZAlpha® stock recommendation is notarized by a trusted third party at the time we e-mail it our subscribers, and is then permanently archived. That helps assure that our performance and risk information can pass stringent audits. ZZAlpha is data driven: we work with objective facts to forecast the price changes and make recommendations, and we work with objective facts to evaluate performance and risk. We provide transparency of recommendations and results that is seldom found in the investment advice arena. stocks, micro-capitalization stocks, IPOs, or stocks listed outside NYSE, Amex and NASDAQ. ZZAlpha LTD. does not handle client funds, does not provide individualized investment advice and does not buy or sell securities. We receive no compensation from anyone based on which stock we recommend. The ZZAlpha® machine learning engine has been applied to over 40 market segments, and results evaluated against benchmarks. As the tables below show, in many instances over the 1,3, and 5 year periods, the ZZAlpha® recommendations substantially exceeded their benchmarks. The results come from recommendations that were certified each morning before market open, to assure they support stringent audit. Notes: In early Sept. 2014 we incorrectly amended bad data received from one of our suppliers, which caused the machine learning recommendations and results to degrade in several portfolios between then and into 2015. We again received bad data in 2017 which may have caused some results to degrade. We have again strengthened validation of incoming data. The results shown reflect the actual recommendations. We generally consider the results for 2015 mediocre. 2016 results were good. 2017 results were mediocre. 2018 results were good until the 4th quarter, and then fell sharply. Not every year of every portfolio is good. We show here results for portfolios of 5 and 20 equities, recommended daily (i.e. 25 and 100 recommendations a week for each market segment). 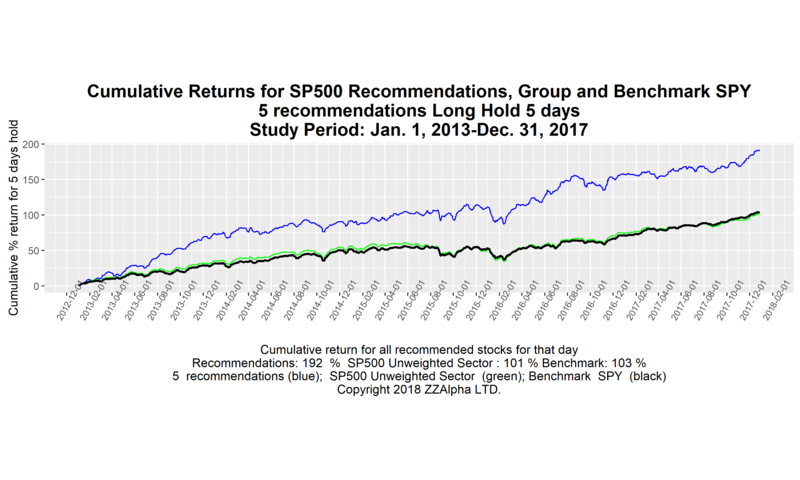 Annualized returns for ZZAlpha® recommendation portfolios. Instances where returns exceed both benchmark and unweighted sector annualized are highlighted in green. These results reflect the sharp market downturn in Q4 2018. We also analyze whether short recommendations (when treated as if traded as long) are less than long recommendations. (The difference between long and short results help indicated the effectiveness of the algorithm on the portfolio stocks.) These are also highlighted in green. 1) Returns are annualized returns, NOT average annual returns. 2) Benchmarks include dividend reinvestment but portfolios omit dividends. 3) Portfolio returns above show returns AFTER payment of commissions each day. 4) We never use leverage or margin in evaluating results. 5) Due to a change in Sector definitions and memberships in 2018, we do not have sufficient data for Sectors and those are omitted. In testing by ZZAlpha by actual market trading of various portfolio recommendations for various periods, the actual net returns track the evaluator model estimates. The returns shown assume mechanistic purchase at a price equal to the opening price on the day of recommendation and sale at a price equal to the opening price 5 trading days later. We expect that professional traders watching market movement at open can improve on these returns, or that speculators choosing to sell in a 4 to 10 trading day window after purchase can often sell above the price at open that we assume for closing the position. In general, smaller portfolios have higher (but more volatile) results than larger portfolios. Please contact us for detailed information and statistics on portfolios of interest. * To be conservative, we often use both the selected index and equal weighted population means as benchmarks in our analysis of returns.